For teens applying to big name schools, there is little in life more stressful than the college application process. Sleepless nights, constant anxiety, and frequent perspiration are some of the all-too-familiar signs that application deadlines are drawing near. But thanks to MITBlogs, prospective students can take comfort with the knowledge that admissions officers are not cold, distant, antiquated white men in wigs, betting on horses and playing cribbage while sorting your application to MIT with the roll of a die. MITBlogs is helping Ben Jones, communication manager for the admissions office and designer of “MyMIT,” along with the rest of the MIT admissions staff, take the fright out of college admissions (and they’re having fun in the process). Those who have not read Jones’ weblog of Ben Jones might be surprised to hear of his infatuation with “The OC,” a television drama on the Fox Network. In fact, many students would be hard-pressed to name interests they have in common with admissions officers. “MITBlogs,” part of the web portal “MyMIT,” is intended to personalize the admissions process and allow students to experience firsthand life at MIT firsthand. Weblogs, or blogs, are not a new phenomenon. If you’ve spent time on the internet, chances are you’ve run into some type of online journal or publication. “This is one of those rare instances when the world of admissions is on par with technology,” says Bryan G. Nance, director of minority recruitment. The internet is full of bloggers (those who publish weblogs) documenting everyday life with pictures, videos, and online periodic publications that resemble web-based journals. Blogs are used by corporations, political campaigns, media programs, and more recently the MIT Admissions Office to disseminate personalized information to a large audience. 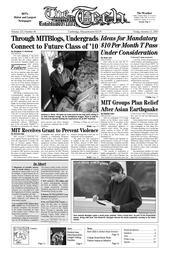 MITBlogs, launched in Sept. 2004, is a collection of weblogs written by admissions officers and current MIT students that is available online to the general public. Consisting of four admissions officer and 11 student blogs (representing all four years at MIT), MITBlogs offers information on a wide range of topics, including a guest blog, presented by Tim the Beaver with highlighted articles by Director of Recruitment Jennifer Rifken, Dean of Admissions Marilee Jones, and Stuart Schmill, director of the educational council. Since its introduction, MITBlogs has proved an invaluable resource to the admissions process. “We want to keep college admissions to a higher ideal by addressing what applicants are thinking about and worried about,” said Matthew L. McGann ’00, assistant director of admissions. “The driving force is student response,” said Ben Jones. “It’s 100 percent real and 100 percent believable.” MITBlogs allows prospective students to connect with current MIT students as well as admissions staff, allowing a more comfortable approach to the admissions process. “MIT sells itself when you get the real story,” he said. Because student bloggers at MIT are employed by the admissions office, some may question the validity of the content of MITBlogs. After all, blogging is simply another tool used by the admissions office to attract new students to MIT. Student MITBlogs are completely unedited by admissions staff, ensuring that blogs at MIT are publicizing the important aspects of student’s lives, be it positive or negative. Students often offer sobering accounts of their experiences at MIT. As can be seen by the response to MITBlogs over the past year, high school students appear to be much more receptive to stories and articles written by their peers than those of admissions officers. This feeling is bolstered by the feedback received through their comments on MIT student blogs. MITBlogs also offers another alluring aspect: the ability to post comments, anonymous or otherwise, at the bottom of an entry. This creates a positive feedback loop whereby prospective students and other readers are able to post their thoughts, ask questions, or make comments regarding a certain entry. In a sense, the ability to comment creates an online community of readers and bloggers that is not available in other written publications. Imagine being able to pick up the daily newspaper, jot some questions at the bottom of the article, and receive feedback in response to your query before you’ve finished your coffee. Response for MITBlogs has been overwhelmingly positive, from both students and parents. “I think these admissions blogs are the greatest recruitment tool I have seen in my college search so far,” wrote Katrina, a prospective member of the Class of 2010, in Ben Jones’s blog. “It is so much nicer to read what real people are doing than it is to read canned things about how great [x] university is.” Parents are also placated when they discover that having a social life at MIT is not only possible, but common. The admissions process can be stressful enough without adding levels of abstraction between the prospective student and the college itself. MITBlogs shines as a direct and easily accessible guide for topics ranging from student life and extracurricular activities to coursework and residential housing at the Institute. MIT is currently the only campus that provides such a high level of feedback and sense of community to prospective students through blogs. At last year’s Campus Preview Weekend, students meeting in person and for the first time already felt a strong sense of friendship through their previous communication on MITBlogs. To see so many students connecting with others after only one day on campus is unprecedented, Ben Jones said. MITBlogs can be accessed through a username at MyMIT, http://my.mit.edu/, or as a link from any of the member blogs, for example, http://ben.mitblogs.com/.